When you open your garage manually, the door can sometimes detach from the trolley on the carriage. Don’t worry, it’s one of our most popular service questions. Fortunately, the solution is quite simple. First, you need you make sure the garage door is open. You’ll have to do this manually, since it isn’t attached to the operator. Just pull the red cord to raise the door, then you can move the whole door back manually. These aren’t very heavy and it’s not too difficult to do – just make sure there isn’t anyone in the way. Once the door is all the way up, pull the red cord at an angle. You’ll hear a *click*. This means the door is secured in place. Now, push the button for the operator, i.e., the button that opens your garage door. The trolley will move by itself and connect back to the door. You’ll see the two align and fit into place. That’s it! It’s that simple. Go ahead and push the button again, just to make sure everything works again. The two should be sync’ed up and ready to go. Power outages are the most common times when this happens. What happens is that the trolley will continue opening or closing at the time of the outage, and may become disconnected with the door. 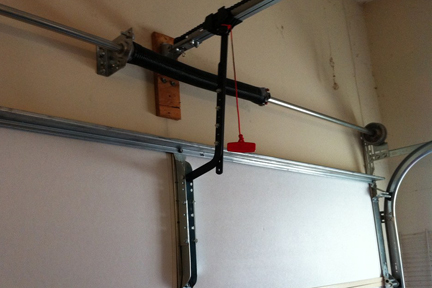 It also happens when people manually open or close the garage door, should the operator be off for any reason. Garage doors are simple in nature – they can run into problems but they’re typically not too difficult to repair. If you have any questions, give us a call at (503) 730-0444.